Ambuja Cement Foundation, the CSR arm of Ambuja Cements Ltd. has been conferred with the prestigious Best CSR & Sustainability Practices Award 2017 in recognition of its concerted efforts that transformed lives by energising, enabling and involving the rural communities, thus facilitating economic progress and contributing to nation-building. Ambuja Cements Ltd., a part of the global conglomerate LafargeHolcim, is one of the leading cement companies in India. Established in 1993, Ambuja Cement Foundation is the social development arm of Ambuja Cements Ltd. exclusively working with rural communities to make them self-reliant and help them utilize their potential for a prosperous life. The award was received by Ambuja Cement’s MD & CEO Ajay Kapur and Ambuja Cement Foundation’s Head Pearl Tiwari jointly from Mervyn King, a Senior Counsel and former Judge of the Supreme Court of South Africa, who also chairs several integrated report councils and governance committees. The recognition was presented by the Asia Centre for Corporate Governance & Sustainability – a reputed, independent institution that works to bring about qualitative improvements in the corporate governance and corporate sustainability practices of Asian companies, optimising the value for shareholders and stakeholders in a balanced manner. 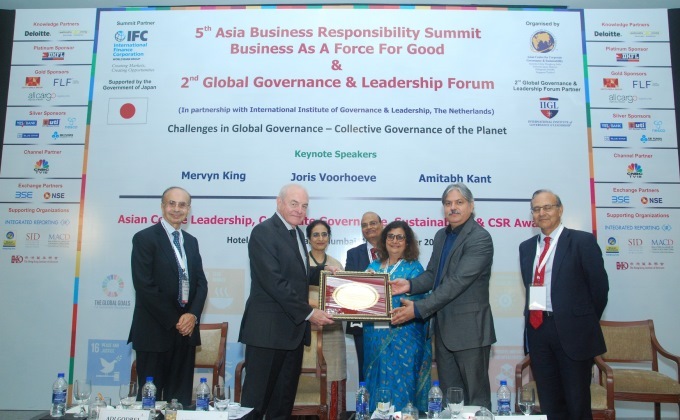 The award ceremony was recently held in Mumbai during the Fifth Asia Business Responsibility Summit that also discussed the sustainable development goals, global governance and leadership. The Jury made a special mention about the Women Empowerment, Water Management and Skill Development initiatives of Ambuja Cement Foundation. Ambuja Cement Foundation has been going beyond CSR activities and recognised as a grassroots pan-India implementing organisation that harnesses the power of partnerships – between communities, Government and other like-minded corporates and NGOs – to help solve pressing community problems and foster prosperity.